Sometimes we reviewers have a tough job finding the adequate words to describe our experiences reading books. The challenge in reviewing any Charles Boeckman book is what can you say that hasn’t already been repeated numerous times in regards to a 92 year old pulp writer who has been at this writing game most of his adult life? Really, not a hell of a whole lot. Thus the wise course is to simply describe in some small detail the actual plot and tell you ahead of time this is a damn good book. Boeckman doesn’t know how to write any other kind. Lauran McCaully works for a radio station along the east coast of Texas. One night, while driving home, she is run off the road by two men in a black sedan. It is all too clear that they mean to kill her and Lauran flees her wrecked car into the brutal countryside hoping to escape them. She manages to reach the isolated ranch of Deputy Sheriff Lee Walton, a widower living by himself. Hurt and weakened by her ordeal, Lauran is helpless and Walton quickly administers to her wounds, gets her fed and allows her a night’s rest in his own bed. The following morning she is able to give him a cohesive account of what happened to her on the road. At the same time, Lee is emotionally surprised at how much he is attracted to this lovely, desperate woman. The attraction is mutual as both quickly get to know each other in the coming days. Although Lee believes Lauran’s accounts of the attempt on her life, his boss, a political ambitious sheriff has other thoughts. When Lauran’s abandoned car is found miles from the scene of the accident it has the body of a dead man in it; a lawyer Lauran had done computer work for in the past. The sheriff publicly accuses her of killing the man over some romantic entanglement and having concocted the entire automobile attack as a means of throwing suspicions away from herself. Lauran is living an ever escalating nightmare. Not only did two men attempt to murder for reasons she can’t fathom, but now it looks like she is being framed for the murder of a dear friend. But she is not alone in her plight, as Lee Walton finds the circumstances surrounding the entire affair too coincidental and his instincts tell him Lauran is being set up. Risking his career, he quits his jobs to help prove her innocence and learn who the real killers are. Now all this would be enough of a thriller plot as is, but Boeckman amps it up even further by setting it against the arrival of a category five hurricane that threatens the entire town should tidal waters crest the beach front barricades. And in the middle of all this, a secret from Lauran’s past re-emerges posing as yet another threat to both her and the man she has irrationally fallen in love with. “Pursued,” is the embodiment of what a fast paced, pulp thriller is all about. There is not a single miscue in the entire tale and it will keep you turning pages at lightning speed, as if the hurricane in the book had leaped out of the pages to rail against the reader’s own imagination. To write like this is both a talent and the result of years of hard work and dedication. The blessing for we readers is Boeckman shows no signs of letting up and I full expect to be reviewing his stuff when he turns 100. Just bloody amazing!!! This wonderful, sci-fi fantasy adventure is the longest work Percival Constantine has ever done. It’s also his best to date. And that’s saying a lot. Having enjoyed his work since he first popped up on the New Pulp scenes a few years ago, what impressed me the most was how each new book revealed a growing, maturing talent that was constantly improving. His last few offerings have been exceptional and “Soul Quest” simply knocks it out of the ballpark. It is a solid, literary homerun. 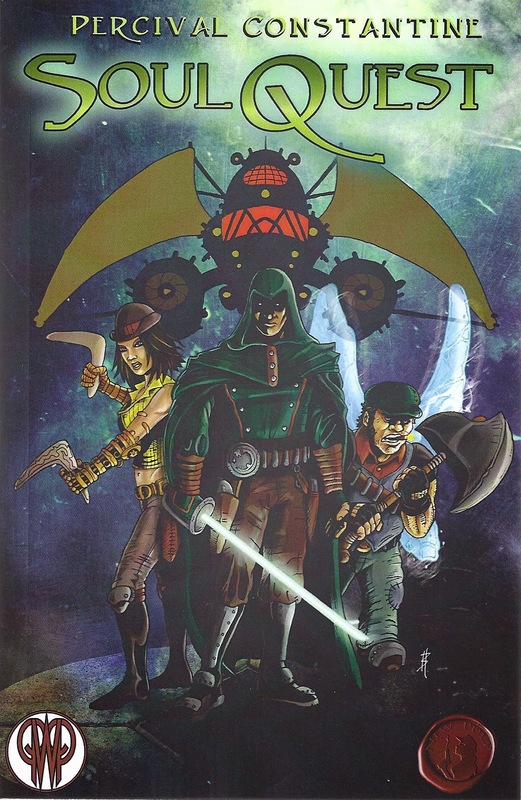 Set in a colorful alien, world, the story centers on a crew of Sky Pirates. Their ship, the Excalibur, is well known, and dreaded, throughout the shipping lanes of various empires. Swordsman Zarim is her captain and his crew is made up of the boomerang hurling Ekala, a beautiful thief, and the winged faerie tough guy, Swul. When Zarim’s mystic mentor, Master Quand, sends them on a mission to find five powerful gems said to possesses unimaginable power, their lives are quickly turned upside down. What Quand fails to tell them is that the High Priest of the city-state of Serenity, Vortai, is also seeking the very same gems for his own nefarious ends. When Zarim and the others are nearly killed retrieving the first two stones, Quand is forces to confess the full extend of the legend behind the powerful rocks. Whoever possesses all five will absorb their power and be able to remake the world in his, or her, image. In other words become a god. Considering Vortai’s streak of sadistic cruelty, Zarim and his pals understand immediately that he cannot be allowed to triumph in his quest. If they don’t find and collect the stones before Vortai, the world as they know it will cease to be. And on that plot road, Constantine puts forth all manner of terrific, fun and original characters, both good and bad. Traversing this amazing new fantasy world, the Excalibur’s ranks swell with the addition of Tanus, a former officer in the Dreadnaught Navy, Reyche, a religious devotee turned vampire and Liran, a white furred humanoid catwoman warrior from the frozen north. Whereas Vortai has his own cadre of relentless killers ready to foil Zarim and his team at every turn. 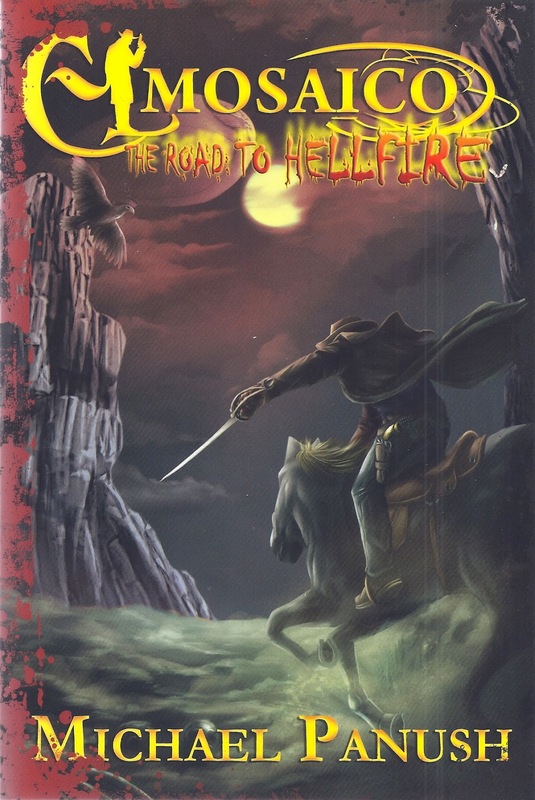 “Soul Quest” reminded me a great deal of those early Ace Paperbacks in which I first discovered science fiction and fantasy as a teenager. The action never stops; the heroes are true romantic rogues in the classic sense and the villains as dastardly as they come. For a big book, “Soul Quest” moved at such breakneck speed, I read through it quickly only to be both satisfied and sad to see it end. Zarim and the crew of the Excalibur are wonderful characters and I really am keeping my fingers crossed we’ll see them again soon. After reading Michael Panush’s first collection starring his western Frankenstein-like monster last year, I was eager to dig into this second volume. This one contains seven new tales of Clayton Cane, a man assembled by a Confederate scientist during the last days of the Civil War from the parts of dead soldiers. Hoping to replenish the ranks of the failing Southern legions, the scientist used voodoo magic to animate the man he had stitched together but then perished before he could duplicate the process. Thus El Mosaico, as he is called by Mexicans, is one of a kind, roaming the world seeking purpose and salvation. Or so he believes. In RATS, Cane finds himself in New York City at the bidding of a several powerful politicians. A rat infestation has been plaguing their district and they hire Cane to find the source and eliminate the pests. But to do so the stitched-up hero must confront a vengeful wraith and put it to rests as only he can. In APACHE GOLD, Cane and a lady school teacher are captured by a gang of outlaws and dragged along into the Arizona wilderness to find an old Spanish gold mine now protected by the angry spirits of long dead Conquistadors. AT COFFIN’S CLOSE brings the patchwork gunfighter to New Orleans to help the only friend he ever had; a man dead for many years. It’s a gruesome tale of voodoo, zombies and a fanatical ex-Confederate Officer bent on taking control of the city. One of our favorites from this collection. Then Cane hires out as a guard on a wagon train going through the high mountains in the deep of winter. While crossing the cursed stretch known as BLOOD PASS, they are set upon by a brood of vampires and quickly imprisoned in caves to be fed upon. THE MAKING OF A GUNSLINGER has Clayton Cane crossing paths with an Eastern writer of dime novels who wants to chronicles his exploits. But when the two encounter an old foe from Cane’s past, neither may live long enough to finish any story at all. Next Cane travels to San Francisco’s Chinatown and hires out to a Tong leader whose opium den is being haunted by a malevolent HUNGRY GHOST. When he learns the secret behind this voracious poltergeist, Cane switches allegiances to lie to rest a suffering soul. As in others of his collections, Panush ends this one with a novella; ON ANGEL’S WINGS. Cane is followed by a motley crew of past acquaintances to a Texas town called Hellfire which is about to be set upon by the very man who created him, Dr. Adolphus Angell. Cane had assumed Dr. Angell had perished in the last days of the Civil War but now learns his creator is not only alive but has made a company of patchwork men fashioned after Cane and with them plans on conquering the world. To do so he requires unique minerals found in the land beyond Hellfire called the Silver Mesa. Thus to reach this spot and mine the sought after element he is willing to slaughter an entire town unless Cane stop him. ON ANGEL’S WINGS is a great finale bringing Clayton Cane’s story full circle as he confronts the evil genius who made him and must wrestle with his own destiny. Can a man created only for war aspire to something grander? The gunfighter known as El Mosaico is about the find the answer to the question as will those readers smart enough to grab this truly outstanding book. If you like weird westerns, they do not come any better than this.